Every year America's golfers spend millions of dollars on the latest driver or the newest balls, never realizing that their own body is the most important piece of equipment they have. If you're stiff, achy, and weak, you can't hit a straight shot. A well constructed, easy to implement golf conditioning program can improve your enjoyment of the game and just might lower your scores. 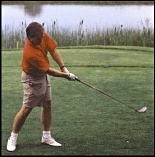 That's why I'm offering an introductory golf evaluation for only $99.00*. During this time we will consult about your strengths and weaknesses, perform an examination (including up to 75 tests), and construct a personalized conditioning program. We will also be able to determine if chiropractic care will benefit you as well. Your regimen will include stretches and simple strengthening exercises to improve coordination. *Implementing your program may require purchase of additional training aids available through our office.